For too long security systems have been separated and isolated from the outside world, only providing information when the worst happens. They have lacked the connectivity and compatibility with external systems that could benefit from the intelligence and information they contain. Smart home technology, intelligent buildings and the Internet of Things (IoT) have seen users’ expectations rise when making investments in any type of system. Because many manufacturers and service providers in other sectors have met those expectations, this accelerates demand for smarter solutions, but the intruder alarm market is lagging behind. There is still a yawning gap between what end users want and what most security systems currently deliver. Security and ‘peace of mind’ are the two main qualities that end users are seeking – but once a system is put in place, a large majority of people simply don’t use their security system. Texecom Connect changes everything by introducing connectivity options that transform the user experience, enabling intruder alarm systems to deliver customer value every day, and to interface with leading third-party smart devices. Security installers can now offer customers a secure system with the additional benefits of automation, smart management and flexible control, all from the established and familiar Premier Elite range of control panels. It offers an immersive experience, allowing customers to take full control of the system, along with other peripherals such as video, lighting, heating, power management and smart control of household appliances. At the heart of Texecom Connect is a professional quality, graded intruder alarm system which uses the proven Premier Elite range of control panels. This also enables the use of Ricochet mesh-based wireless connectivity, which is an integral part of the panel series. Texecom Connect uses an app, a SmartCom smart communicator, a SmartPlug and an API to deliver increased flexibility. There’s also a range of Ricochet-enabled accessories, allowing installers to up-sell to customers, including to those with existing alarm systems. Designed for iOS and Android devices, the Texecom Connect app completely transforms the end user experience, encouraging people to actively want to interact with their home, enjoy the new possibilities that are open to them and receive the peace of mind that comes with knowledge and control. They can now control their security directly from their smartphones or tablets and receive notifications of system events and monitor cameras or activity from anywhere in the world. The app is specifically designed to ensure that users are never more than a few clicks away from the screens they need to access. This makes it very user friendly, which also helps to address issues with customers who stop using alarm systems. This is a common trait, often resulting in service contracts being cancelled and future investments in security being abandoned. This ethernet and wi-fi enabled smart communicator connects any Premier Elite control panel to a local area network. It communicates using outbound connections, removing the need to open any router ports, ensuring simplicity of installation and maximum security. Any installation with an internet connection can reliably use Texecom Connect with the addition of the SmartCom. Any mains-powered device can be controlled remotely using the Ricochet-enabled, wireless SmartPlug. Sitting between a wall socket and the power plug of a device, it is controlled via the Texecom Connect App. The Texecom Connect API is an integration protocol that interfaces Premier Elite control panels with third party technology. There are currently a number in progress, some with smart connectivity providers and others with established players within the security market. Central to the Texecom Connect experience is the timeline. Both past and programmed events are clearly presented, giving the user instant access to review events that have transpired. This ‘at a glance’ timeline allows users to manage their connected security system how they want to. Some may choose to manage by exception, and only be notified and interact when changes or events occur that differ from what they expect, while others may want to actively manage their property and make regular changes to the alarm and home automation functions. Whatever they choose, it’s all made possible from a clear and unambiguous status screen. This is the basic method of operating the home security and automation system through the app, providing pre-set and customised system profiles with at-a-glance system control. For example, a basic armed mode would set the system to be active. However, this could be customised with work and holiday modes. The work mode might set the heating to a low level and activate an external camera, while the holiday mode could activate lighting to simulate activity in the premises. It’s also possible to switch on household devices like television or to operate automated blinds. Modes can be supplemented by adding ‘recipes’, which are automated ‘cause and effect’ options (see below). Texecom Connect is programmed on the basis of cause and effect, and recipes are a user-friendly way of describing the programming actions that are used for automation. Example recipes include, ‘when I enter through my front door and it is dark outside, turn on my hall light’ or ‘when someone is detected at my front door, send a notification message to my phone’. A range of recipes can be grouped into system modes (see ‘Multiple Modes’ above), so certain recipes only take place depending on the mode of the system. In the examples above, a user may only want to be notified when someone is at their front door when they are away from the premises. 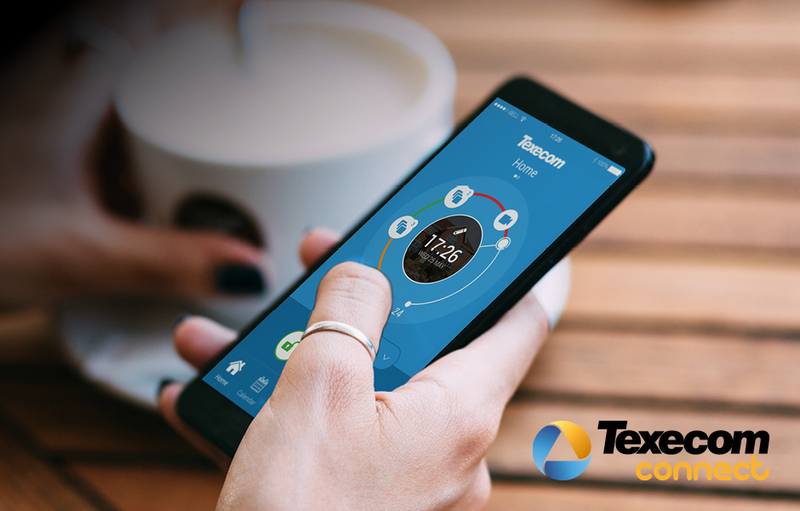 By ensuring that the creation and management of recipes and modes is simple and easily achieved from the app, Texecom Connect takes significant steps towards eliminating fear and confusion about intruder alarm systems, while increasing interaction and real-world benefits. Texecom Connect adds value to security systems by delivering the features and benefits that end users are demanding, giving them the flexibility and freedom to enjoy an interactive and positive experience. Security installers can really benefit from this by offering systems that don’t feel like a ‘grudge purchase’. These features also enhance site management, and for many users – both commercial and residential – they create a genuine return on investment. If a business can realise increased power savings, reduced costs and overheads, enhanced management of health and safety issues and create proof of compliance – all via their intruder alarm system – they are unlikely to consider the purchase as a grudge. If a homeowner can enjoy automation, interaction and connectivity with other devices and systems, and use their intruder alarm in a proactive way on a day-to-day basis, they will also perceive it to have a higher value. The technological landscape is rapidly evolving, and Texecom Connect puts security installers at the forefront of that change!